In 1543, some Portuguese sailors on a Chinese ship drifted ashore on Tanegashima Island in Kyusu, thus inaugurating exchanges between Japan and Europe. But the Tokugawa Shogunate established a seclusion policy about a century later, severely restricting exchanges between Japan and Europe. Two important innovations for Japan from Europe during the one hundred years until the seclusion were firearms and Christianity. These had great impact on Japanese history and culture. European maps also had a great influence; as great as firearms and religion. Westerners thought they had discovered the unknown country of gold, Zipangu. This had happened accidentally in that great age of discovery, making clear another point on the surface of the globe. However, the incident meant even more from the Japanese standpoint since it caused the Japanese people to acknowledge the world outside. Till that time the Japanese people had their own geographical concept of the world consisting only of Japan, China, and India. Exploration activities during the great age of discovery played an important role in spreading geographical knowledge gained in the West to civilizations in other parts of the world. Such encounters between Japanese and Western views were made in the second half of the 16th century. This impact brought about the production of the folding screen world map. The second half of the 16th century is notable as the period of the dawn of modem cartography in Europe. Literary works on geography and maps created by Claudius Ptolemaeus in the second century were revived in the early 15th century after a long period of being ignored during the Middle Ages, and were distributed in print at the end of the century. Portugal and Spain started efforts to discover the areas unclaimed on the maps. They sent exploration voyages to many parts of the world in late 15th and early 16th centuries, led by Vasco da Gama, Christopher Columbus, Ferdinand Magellan and other explorers. They confirmed that Zipangu was actually Japan, identifying it as the easternmost point of the Eurasian continent. Maps started to depict all parts of the globe. The second half of the 16th century was also the period when there was notable progress in the projection method of cartography, and maps began to be printed and distributed by mapmakers in the Low Countries in northern Europe. A typical example of the development of modem cartography is Theatrum Orbis Terrarum by Abraham Ortelius, the atlas of the world published in Antwerp. The first map shows how people in those days saw the world. It looks somewhat awkward to us. A giant island lies in the North Pole area, and in the Southern Hemisphere, a massive continent extends across modem Australia. But the general idea of the world is not very different from that of today. Missionary boys brought the atlas back to Japan when they returned from their trip to Europe in 1590, and it is certain that the Japanese people in those days shared the same geographical view of the world. While views and maps of the world were encountered and exchanged between the East and West in the second half of the 16th century, the Japanese learned a lot from maps produced in Europe, which is evidenced by the folding screen maps. More than twenty works produced from the Azuchi-momoyama to the early Edo period (late 16th century through the early 17th century) are well known. Maps showed variety, such as a map of the world, a pair of maps of the world and Japan, a city map, and a pair with the map and a western painting. The three folding screens, which date back to the early 17th century, give useful information on exchanges between the East and the West, since the original European works on which they were based are identified. The three screens are also important from the viewpoint of Japanese art history, as the early great works of art produced under the influence of western art. The oldest group of maps describe navigation routes with the Iberian Peninsula as the central point. Depictions of wide rivers and large lakes in inland areas remind us of older maps of the world created by Portugal and Spain rather than maps of Ortelius and other maps made in Flanders or the Netherlands. It is assumed that these maps were produced based on Portuguese originals. The maps are believed to have been produced around the year 1592, when Toyotomi Hideyoshi attempted to invade Korea, since the maps carry many bits of information that are related to the invasion. The maps also carry names of places in northern China that had been unknown before the invasion. Nagoya in Hizen Province, where the stronghold for the invasion was located, is drawn larger than it actually was, and navigation routes to the Korean Peninsula are also described. The maps are believed to be the first works with European influences of the early 1590's by Japanese cartographers who learned from European maps. Meanwhile, researchers in the East and the West have found that the screen maps created by painters in the Jesuit school are based on the world map created by a Dutch map maker, Petrus Kaerius, in 1609. 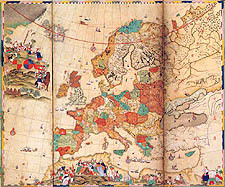 Japan's acquisition of European maps shifted from the Spanish and Portuguese style to the Dutch style, which conformed to the major trend of Japanese history. Kaerius's world map of 1609 has paintings of the ten most powerful sovereigns of the time surrounding the map. The figures of the sovereigns around the map were adopted as a motif in Taisei Oukou Kiba-zu Byobu, or the folding screens with the motif of Western royal cavalry that are fine examples of Japanese art in the early days of Western influence. They are owned by the Kobe City Museum and Suntory Museum of Art. This shows that the world maps introduced to Japan in those days were not only an important way to convey geographical information, but also influenced Japanese culture in early modem times in many ways. In particular, the folding screen map owned by the Imperial Household Agency is acclaimed the best world map produced in those days. The map inherited almost all factors of the original map with some improvements in representation of Japan and Asia, which is quite meaningful. Another remarkable feature is that ten cities are marked on the Japanese archipelago on the map. Not all cities are identified, but the largest ones are recognized as Edo and Kyoto/Osaka, and one is identified as Sunpu, given the distance between the mark and Izu Peninsula on the map. The reason why Sunpu was chosen as one of the ten major cities is probably because Tokugawa Ieyasu lived there for the last ten years of his life. According to historical records, Tokugawa Ieyasu looked at the folding screen with maps of the world in September 1611. The folding screen world map owned by the Imperial Household Agency might be the one Ieyasu looked at. It would be quite difficult to prove this, considering the length of time it would have taken for the original to reach Japan, but many historians believe that this is so. There are other examples of maps inspired by Kaerius's world map. The one owned by Kosetsu Museum of Art forms a pair with a world map and a painting of the battle between Roman soldiers and pagan Turkish soldiers. The one owned by Kobe City Museum forms a pair with a world map and city maps of Lisbon, Seville, Rome, and Constantinople, with a Christian feel about them. Another feature of this map is that the original rectangular map described using Mercator projection was reformed to an egg-shaped one and Japan appears in massive size on a projecting part. In addition, figures of ships appear in the East China Sea on the map that are not found on the original map. They are suspected to be trade ships approved by the government which shows this map is quite important since it tells us more than mere decorative art would do. The early 1590's were a notable turning point in the history of maps in Europe as well as in Japan when Japanese map artists started to produce folding screen maps based on the world maps introduced by the Spanish and Portuguese. During this period, Japan's recognition of world geography was totally changed. Japan studied European maps and reproduced them on folding screens. On the other hand, Europe also improved its geographical knowledge of Far East Asia. The 'discovery' of Japan in 1543 was, for Europeans, the solution to the old question of where the east side of the Eurasian continent ended, which had been unsolved since Ptolemaeus' day. However, Japan and the surrounding areas must have been mapped out based on limited information and imagination. Even the Portuguese map, by those who were the discoverers, shows the Japanese archipelago in a shape that is quite different from reality. 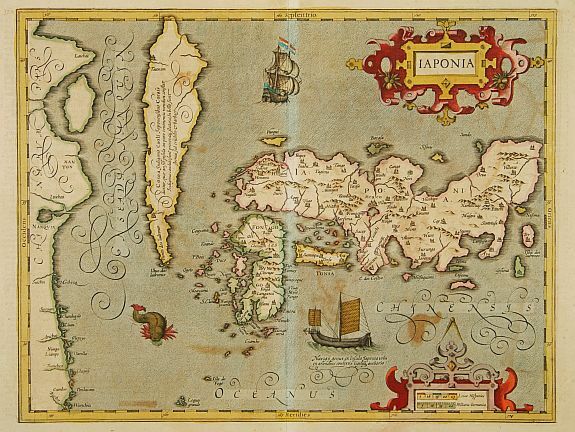 The Theatrum Orbis Terrarum produced by Ortelius in 1570 has two different shapes of Japan in one atlas. But the Japan that appears on the map created by the Portuguese cartographer Teixera in 1595 is depicted in a shape that can be recognized by anybody at a glance. This means that Europe had acquired new knowledge on the map of Japan immediately before Teixera made his map, which was quite new to Europeans and different from their knowledge until then. Similarly, a group of the oldest folding screen maps made in the 1590's have more sophisticated descriptions of Japan and the Far East than European maps of the same period. This indicates that Japan (or Asia) created its own new maps in this period. Before the Edo period, there were no maps in Japan except several examples of general maps known as Gyoki-zu that were drawn in simple shapes used since ancient times. Representations of Japan on folding map screens are an advanced version of such Gyoki-zu, and highly developed. The late 16th century is truly a turning point in the history of maps both in Japan and Europe. The late 16th century was also a turning point in another respect. The chief missionary of the Jesuits, Alessandro Valignano, left reports of his tours in Japan in 1583 and 1592. Comparison between his accounts of Japanese geography shows that the second report is in much greater detail than the first. Valignano wrote that the detailed information on Japanese geography in the second report is attributable to the devoted research by a person named I.Moreira. His statement is quite important. Given documents by Jesuit missionaries in the 17th century, such as the representation of Asia on Kon-yo Bankoku Zenzu, a large map of the world created by Matteo Ricci and the description of the Japanese geography in History of the Churches in Japan by Joao Rodriguez, it appears that the Jesuits acquired detailed information on the geography of Japan and Asia. Some historians say that the Society had strong interest in creating maps of the areas where they went on missions and was involved in producing new maps of Asia. The late 16th century was the time when Europe truly discovered Japan. Considering the facts I have mentioned so far, even though it has been a matter of controversy, it seems that the Europeans initiated the development of cartography in Japan. Some historical records imply that Japan offered some information that helped to make the maps more sophisticated. No clear evidence has been found so far that could end the controversy, and what we can do now is collect circumstantial evidence. I believe that the development of cartography in Japan is attributable not solely to one-sided efforts by Japan or Europe, but the results of exchanges of information. However, it is reasonable to consider that Europe contributed more to the development of maps in Japan and the Far East, from the viewpoint of the representation of the Japanese archipelago on the world map. The folding screen maps do not simply indicate that Japan learned from European maps and reproduced them on folding screens. They mean a significant turning point in the history of cartography in Europe. Artists who made folding screen maps made first-class world maps that were not to be found anywhere in Europe. I earnestly hope for greater research to be conducted on the folding screen maps that evidence large-scale cultural exchanges between the East and the West.